Prestige Deck Coating is known for local and residential deck waterproofing excellence. Perhaps you were unaware that we do large commercial jobs as well. 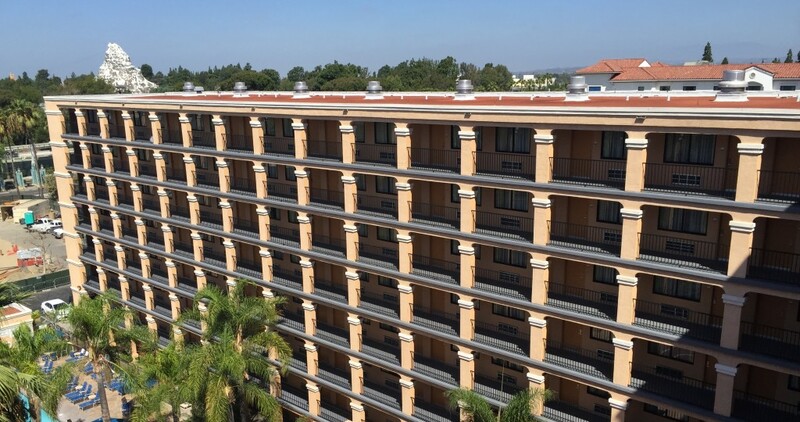 Recently we traveled up near Disneyland to repair and coat the Marriott Fairfield Inn. 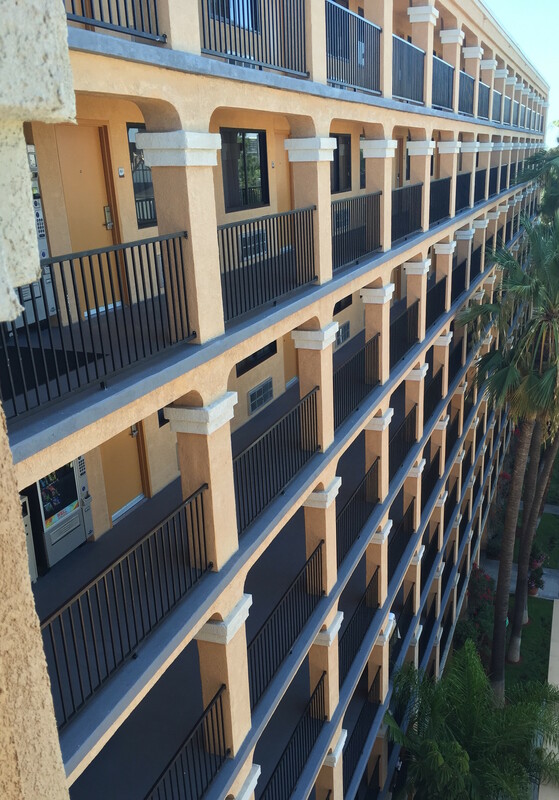 We treat commercial balcony deck coating like a residential job…with care. What allows us to scale a Matterhorn sized project like this, even as a family owned and operated company, is our dialed in 5 step method. In fact, our custom, on the site waterproofing system is highly adaptable. It was developed in a variety of contexts, and for a variety of people, so it is meant to meet any need. As you can see from the photos, each balcony is the same size. This allowed us to strategize and replicate easily. 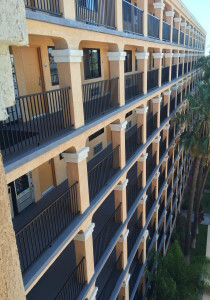 Commercial balcony deck coating requires uniformity. This is for aesthetics and function. Each balcony has a slope for run off sheeting. This means that when it rains (and it will this winter), the Marriott needs to be assured there will not be pooling on the decks. All industry code decking has built in sloping so the water sheets off the deck edge. Prestige Decking makes sure that the industry standard of slope is maintained. After one hour of rain, the water level should not be deeper than a dime laid flat. We make sure that each commercial balcony deck coating deck is waterproofed from foundation to perimeter through each level of coating. *Metal lathe is stapled on the plywood substrate or if the previous coating is intact, we can coat right over it. *polymer modified concrete is the first coat. The polymer helps flex and strength. *The key step we use is putting chop strand fiberglass in between our two concrete coats. *After a second skim coat of concrete, we add a texture of your choice. This gives the deck a grip. *Last, are two waterproof coats of concrete fortified paint sealer. Commercial balcony deck coating is like a stroll down main street! With Prestige Decking, the happiest place on earth can be your deck.